This quill box, crafted in 1998 by Anishinaabe maker Mildred Aguonie of Manitoulin Island, was obtained by the MSU Museum through a donation of quill boxes from the collection of Katherine C. Vail. The round box stands 3 1/2" tall with a diameter of 8 1/2". The top and side faces are covered with quills woven on a birch barch underlay, and sweetgrass rims the seams. 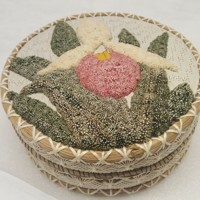 The top face depicts the lady slipper flower using dyed quills arranged with the tufting technique, providing a raised image. The inside of the box features a sale-slip from the intial purchase (MSU Museum, 2017).